Instructions: Prepare a 5 x 7" white card base. Layer with a piece of the Oakberry Lane paper on top 1/4" smaller. Die cut one Intricate Swirl frame out of white cardstock, add foam dots to the back and adhere to the card. Stamp the tree from the Sugar Hollow set on white with the Library Green, color in with the Coffee ink and Emerald Green ink. Die cut with the matching die, add foam dots and adhere to card. Die cut one of the squirrels from the paper pack and adhere to card. Stamp the flowers on white with the Manganese Blue, color in with the Forget Me Not, cut out with the matching die, high light the edges with more of the Manganese Blue. 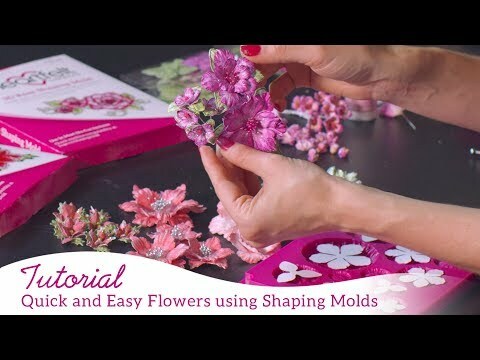 Shape using the Blossom Shaping Mold. Add stamens in the center. Stamp the leaves on white with the Library Green, color in with the Leaf Green, cut out using the matching die, shape using the leaf mold, highlight the edges with the Emerald Green. Adhere to card. To finish, add glitter to the flowers and leaves.